What you need to know before trying it yourself. You’re in desperate need of a touch-up: your frizzy locks need to be smoothed out and your go-to stylist can’t shoehorn you into his packed schedule — so who’s going to chemically straighten your hair? What’s a girl to do when she has to take matters into her own hands? D.I.Y, of course! We know, carrying out straightening treatments at home can seem scary, but your locks are desperate, and luckily, there are kits that you can safely use at home. Whether you’re using a relaxer or a keratin hair treatment, read on to learn how to chemically straighten hair safely at home. Editorial Note: Before deciding to chemically straighten hair at home, make sure you read all necessary precautions provided by the kit you have purchased. Keep in mind that with chemical treatments (especially relaxers), the process is time-sensitive. Set a timer or an alarm, and make sure you’re carrying out this process in a well-ventilated room; open your windows or do it outside if possible. On relaxed hair, make sure you’re really in need of a touch-up — if not, you may risk over-processing your hair. If it’s been around 6-8 weeks after your last treatment, or you have at least a quarter of an inch of new growth, you’re in the clear. However, if you have recently removed braids or undergone a colour treatment, it’s good to hold off from relaxing for about another week to prevent any irreversible damage. Step 1: After washing and conditioning, use a comb to part your hair into 4 workable sections, by parting down the centre of your head (front to back; ear to ear). Using gloves, apply the keratin treatment to your hair, section by section, going from root to tip, using an applicator brush. Step 2: For even distribution, comb the treatment through your hair with a wide-toothed comb, which will also help to remove any excess product. All of your strands should be coated. Step 3: Blow-dry each section of your hair using medium heat, pointing the concentration nozzle down the hair shaft, which will help seal the hair cuticles down flat. Step 4: Part your hair the way you normally wear it to avoid styling your hair after the straightening process, which can result in kinks forming along the surface of the hair. In 1-2 inch sections, begin to straighten your hair at 230ºC degrees (usually the highest setting in most hair straighteners). Step 5: Leave your hair as it is for the next few days, or at least up to 72 hours. Sleep on a satin or silk pillowcase to protect your strands, as cotton creates more friction and can damage your freshly-treated hair. After 72 hours, you can carry out your styling or wash and care routines as normal. Step 1: Mix the relaxer and activator until it’s free of clumps and fully combined. Step 2: Use a comb to part your hair into 4 workable sections by parting hair down the centre of your head (front to back; ear to ear). Step 4: Using gloves, begin applying the relaxer to your new growth, starting with the back area, one section at a time, parting the hair horizontally within each section. So basically, it’s part, apply, and repeat. Only use the smoothing technique during the application by using the back surface of a comb’s bristles (if you comb the product through using the teeth, instead of smoothing the relaxer onto the hair, it may cause breakage). Repeat this process on all 4 sections of your hair, leaving your front and back hairline to last. It’s also worth keeping in mind that the minute you apply the relaxer to your hair, the chemicals are in full effect, so as you finish one section, quickly move onto the next. Don’t spend too much time on one area, as this can lead to over-processing. Each section should take you around 5-8 minutes. Step 5: After you’ve completed your last section, it’s now time to wash. Wash your hair with a neutralising shampoo to deactivate the chemicals, using the smoothing technique with your hands until the all the relaxer has been rinsed out and the water runs clear. If you scrub or massage your scalp, it will burn and cause irritation. Step 6: Carry out your normal wash, condition and styling routine. If your hair needs extra TLC, opt for a deep conditioning treatment. 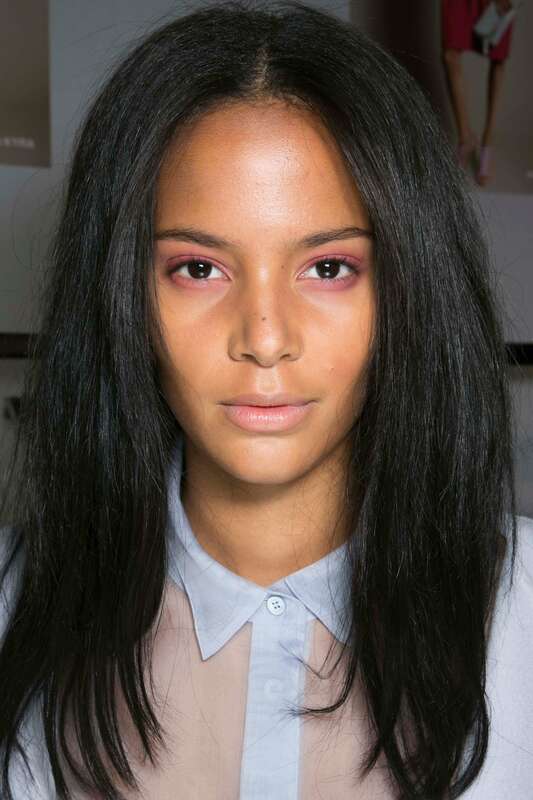 Have you tried these at-home methods to chemically straighten hair? Hair straightening treatments: Should you try them?